"This is one of my favorite Tish Thawer reads. As always, the author brings the magick to the page, and especially with this book. One of my favorite aspects was the world-building. I found it very beautiful with the portals that led from purgatory to gorgeous cities such as San Francisco, New York, and Tokyo." "...this was an addicting, thrill ride of a read which kept me turning pages and cursing real life that kept interrupting me. A new take on a tale that is literally as old as time, I would challenge anyone to predict the ending. BRILLIANT!" 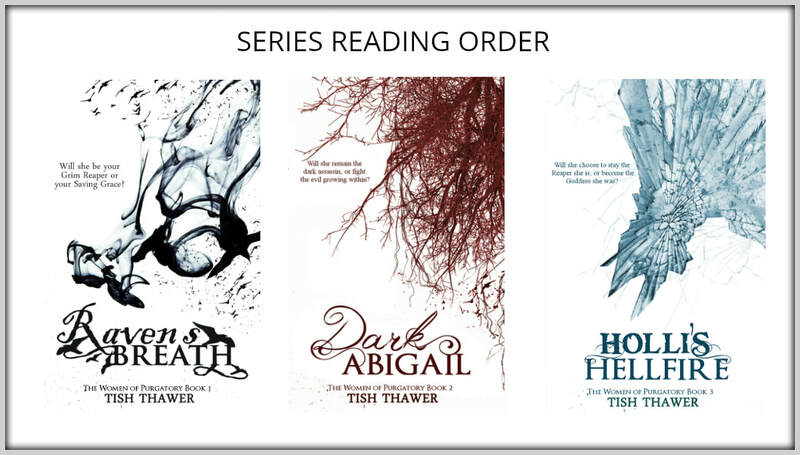 "Words to describe Tish Thawer’s Raven’s Breath…Intriguing, Unique, and an all-around GREAT READ!" Raven can breathe life into you, or siphon the life from you...the choice is yours! They say your life flashes before your eyes when you die. But what you didn't know...your last thoughts determine whether Raven becomes your Grim Reaper or your Saving Grace. Death has a sinister plan, but his favorite female reaper has been given a new power that will combat his secret mission. The only issue...she hasn't discovered it yet. Will Raven put the pieces together in time, or will Purgatory be destroyed forever?